BTS Tours have been operating guided excursions into the World Heritage Listed Daintree Rainforest and Mossman Gorge since 1985. We celebrate our 30th year gathering knowledge of the Daintree. 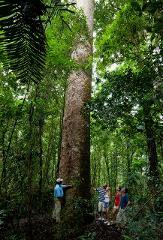 BTS Tours has operated guided trips into the World Heritage Listed Daintree Rainforest since 1985. We celebrate our 33rd year sharing with visitors out knowledge and experiences of the rainforest habitat. Transfer package including Port Douglas and Mossman Gorge From Cairns and Cairns Northern Beaches. Port Douglas to Mossman Gorge. Return transfer special when also booking our Daintree Rainforest Full Day Tour. Pick up from your holiday accommodation. This Product does not include your entry fee into Mossman Gorge which can be purchased on arrival at Mossman Gorge Centre. This special rate applies only when booking our Daintree Rainforest Tour. 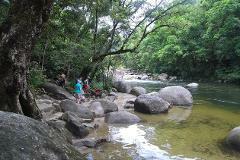 Return Transfers to Mossman Gorge. Bus pick up from your holiday accommodation. This Product does not include your entry fee into Mossman Gorge. 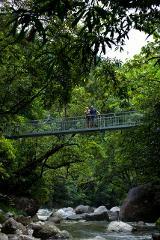 Entry fee's can be purchased on arrival at Mossman Gorge Centre . 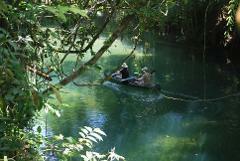 Join Ngadiku guided rain forest walks with an indigenous guide. 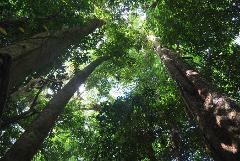 On your visit to Port Douglas, an opportunity to join Ngadiku guided rainforest walks with an indigenous guide. 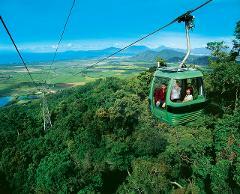 Join our transfer service that connects you with the Skyrail cableway, Kuranda Village and Scenic Train. Includes tickets / fares for Skyrail and the Scenic Train.